Queen. The name speaks volumes to many and many know of what it means in the world of music entertainment. Whatever you may call them…. icons, legends, or celebrity rock stars, the British rock band known as Queen have become famous across the world, dating all the way back in the 1970s. For almost two decades, the band, which consisted of Freddie Mercury (vocal), Brian May (lead guitar), Roger Taylor (drums), and John Deacon (bass guitar), dominated radio waves, producing hit after hit and skyrocketing into universal acclaim in the world of music; winning awards, topping charts, and becoming one of the world’s best-selling musical artist. In the realm of filmmaking, Hollywood has also taken a particular shine towards Queen and their music, with many theatrical motion pictures that feature the band’s iconic songs, including 1982’s Wayne’s World (Bohemian Rhapsody), 1986’s Highlander (Who Wants to Live Forever), 1992’s Peter’s Friend (You’re My Best Friend), 1994’s D2: The Might Ducks (We Will Rock You and We Are the Champions), 2001’s Moulin Rouge! (The Show Must Go On), 2003’s Ella Enchanted (Somebody to Love), and many, many others. Now, 20th Century Fox (along with New Regency and GK Films) and director Bryan Singer (and Dexter Fletcher) presents Queen’s story underneath a cinematic guise with the movie Bohemian Rhapsody. Does this latest biopic drama rise to its musical occasion or is it all sound and no theatrical storytelling to the infamous band’s tale? As a young man in London in 1970, Farrokh Bulsara (Rami Malek) is a college age young man who works as a baggage handler at Heathrow Airport; searching for finding a purpose to aspire into in his mundane life. One night, after watching a local band Smile perform, Farrokh convinces their guitarist Brian May (Gwilym Lee) and drummer Roger Taylor (Ben Hardy) to make him their new lead singer, after giving them a small sample of his incredible vocal range. Within time, the band, after adding bass guitarist John Deacon (Joseph Mazzello) to their group, change their band name to Queen, which was picked out by Farrokh who eventually changed his legal name to Freddie Mercury. Following their success, Queen hires a new manager in John Reid (Aidan Gillen) and grows increasingly experimental in the way they blend different musical genres together, much to the disapproval of their then boss at EMI record label, Ray Foster (Mike Myers). Before long, the band begins to touring around the world to sellout crowds and creating big hit songs, while Freddie (becoming a celebrity in his own right) begins to embrace his more flamboyant side and queer sexual orientation. However, as Freddie’s wild personal life start to derail the musician, it also threatens to tear Queen apart and creates more and more distance between him and his onetime girlfriend / lifelong companion, Mary Austin (Lucy Boynton). It goes without saying that almost everyone knows of the musical band Queen or (at the very least) knows a handful of their songs; finding a lot of the “top hits” being totally catchy and completely melodic to the ears. Heck, some of their songs have been around for more than forty years and many (including myself) still find them lyrically great, despite the aged release and the ever-changing genre styles of the music industry. Of course, like a lot of people of my generation (i.e. my age), my first introduction to Queen was from 1992’s Wayne World with the infamous car scene that featured “Bohemian Rhapsody”. In addition, I was further introduced (at a young age) to Queen’s music from 1994’s D2: The Mighty Ducks, which featured “We Will Rock You” and “We are the Champions”. From there, I began to hear Queen’s music from either on the radio or from various CDs (again, remember I grew up in the 90s). Even in today’s world, many people still continue to play Queen’s music, with the band numerous songs still relevant and popular as when it was released many years ago. In the end, Queen and their music are iconic in their own right and stands the test of time within the other similar musical groups / artists of greatness. Of course, this brings me back around to talking about Bohemian Rhapsody, the 2018 film that tells of the story of Queen’s rise to fame and everything that came with it. I do remember hearing about this movie when it was first announced and (to be honest) was quite intrigued by it, especially since it was going to be a cinematic telling of how Queen (the band) became musical legends. Plus, with the movie’s two trailer being released, it was almost a forgone conclusion (and almost guarantee) that the movie would showcase many of Queen’s famous songs throughout the feature, which is what I was looking forward to seeing. With a promise for its songs as well its “behind the scenes” narrative, I was definitely looking forward to seeing Bohemian Rhapsody, hoping for a “beyond the limelight” look at the famous musical band and their journey together through fame and fallouts. So, what did I think of it? Well, despite some critics out there giving it some mixed reviews, I personally liked the movie. Yes, there are some problems that I can’t overlooked, but Bohemian Rhapsody is a formulaic yet fun musical cinematic journey that’s worth taking, especially for fans of their famous top hit songs and a examination into the life of lead singer Freddie Mercury. Perhaps one of the more interesting aspects of the film (at least one that appeared on social media / internet newsfeed) was the movie’s director Bryan Singer, whose previous directorial works includes films like Superman Returns, The Usual Suspects, and several of the X-Men movies (i.e. X-Men, X2: X-Men United, X-Men: Days of Futures Past, and X-Men: Apocalypse). While Singer has directed many features before, the director made headlines news with Bohemian Rhapsody for him being fired from the position of directing this biopic drama several months into its production; citing for his periods of being absence and him clashing with the cast and crew. With Singer fired, directorial duties were then passed onto Dexter Fletcher, who’s known for his acting work on Layer Cake, Band of Brothers, and Lock, Stock, and Two Smoking Barrels, while his directorial includes projects Sunshine on Leith, Wild Bill, and Eddie the Eagle. That being said, despite Fletcher completing the principal photography and overseeing the film’s completion during post-production, Singer still retained the title as director for Bohemian Rhapsody, while Fletcher was award the title of “executive producer”. Thus, all this talk of directors being fired and hired hit the internet, which sort of both helped the movie (fueled the fire) as well as cast a shadow of doubt on the project. However, in comparison to how other recent films that this particular director dilemma (I’m looking at you Solo: A Star Wars Story), Bohemian Rhapsody stays a float more than its sinks underneath its own turbulent waters, which (in hindsight) is a good thing. Together, both Singer and Fletcher (mostly following Singer’s blueprint vision of the film) seem to make Bohemian Rhapsody cohesive and flow in their helming this biopic drama, highlighting and examine many of the pivotal moments for the band as well as showing the personal life of lead vocalist Freddie Mercury. The film’s script, which was done by Anthony McCarten and Peter Morgan, present the main narrative on the rise and fall of the band from Queen’s humble beginnings to a climatic moment for the band in 1985 and everything in between (including band fights and fall outs). Of course, there might not be historical inaccuracies in the film (of which some have criticized Bohemian Rhapsody for doing, but real-life stories that undergo a cinematic representation are known for doing that….to spice up events for theatrical taste. Still, it didn’t bother me and I kind of expected it. All round (from the script to directing), the movie captures what it sets out to be and what it wants to tell (no more, no less); making Bohemian Rhapsody a solid yet slightly flawed (more on that below) biopic drama that succeeds more than it fails. Naturally, one of the big selling points of this film is the musical sequences that are featured in Bohemian Rhapsody and let me assure you…they don’t disappoint. As to be expected, the movie highlights a lot of Queen’s hit song throughout the feature, with each one feeling genuinely epic and filled with energy and cinematic style (more on that below). Of course, the film’s shows the creation of the movie’s namesake (i.e. Bohemian Rhapsody), which is kind of interesting is see how it was made (of which I didn’t know). Additionally, the film builds to a climatic point in Queen’s career, with the final 20 or so minutes becoming a festive musical sequence of their performance during the Live Aid performance Wembley Stadium in 1985. 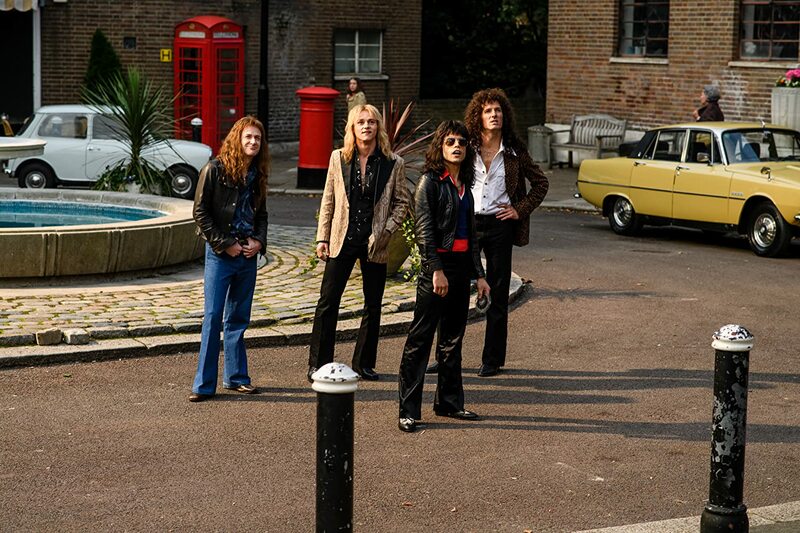 In short, while some might disagree with how the movie ultimately take shape (for better or worse), no one can deny the film’s musical charged usage of Queen’s music throughout the feature. The behind the scenes technical presentation for Bohemian Rhapsody is definitely one of the film’s highlights, showcasing a lot of the story’s aesthetics and nuances through the various pieces of background sets and a variety of cinematic aspects. Perhaps one of the standout ones of the movie is wide variety of costumes that are presented (and worn) by the film’s characters, which were design by Julian Day. While majority of the costume are appropriate and fit the times period of which the movie covers (from the 70s to mid-80s fashion trends), what makes Day’s costumes shine the most is the outfits design for Freddie Mercury to where, displaying the extravagant and flamboyant side of the singer’s lifestyle through his wardrobe attire. 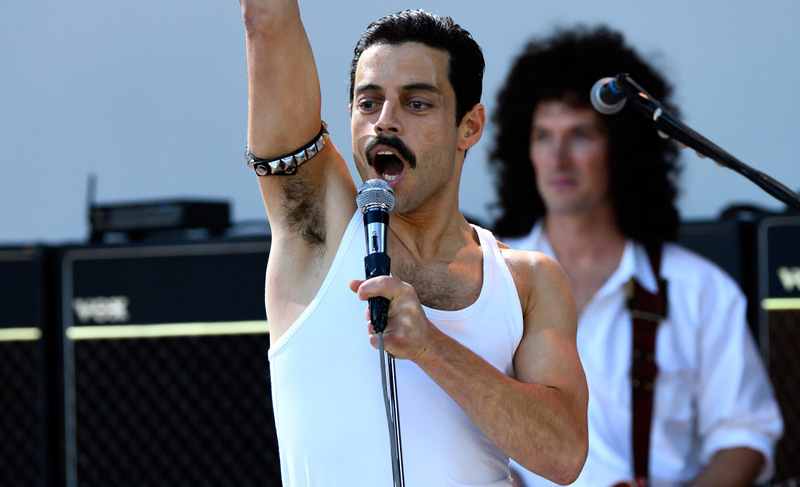 Additionally, the film’s cinematographer Newton Thomas Sigel and the film editor John Ottman provide some solid work on their parts, making Bohemian Rhapsody visually stylish and cut together in way that’s entertaining and exciting to flash…especially during the film’s musical sequences. Unfortunately, Bohemian Rhapsody fails in certain areas, which makes the movie falter in its undertaking and, while still really good and entertaining, makes it slightly outreach of greatness. The most notable one that many will come across while watching this film (including myself) was the simple fact that the movie mostly focuses primarily on Freddie Mercury and not so much the other band members of Queen. Of course, the lead singer of Queen has always been a “fixed point” of discussion and to exam under a cinematic microscope, which Bohemian Rhapsody does in showcasing the rise and fall of Freddie. However, this means that the movie sort of becomes the “Freddie Mercury show”, with majority of the other players in the movie (be it the other band members or any other supporting character revolving around Freddie) seem a bit underdeveloped. However, the actors / actresses selected for these particular characters help elevate them beyond their limited character builds in the movie (more on that below). Suffice to say, that if a viewer walks into watching Bohemian Rhapsody expecting more of the “life and times” of the other band members (Brian May, Roger Taylor, and John Deacon), you’ll might be slightly disappointed. Personally, I wasn’t as I like how the movie was presented, but it would’ve been interesting for Singer / Fletcher to present “their” story in the movie. Plus, don’t forget that both that the real Brian May and Roger Taylor did act as consults on the film, finding Bohemian Rhapsody acting under the guise of “honoring” Freddie and showcasing his personal drama. Another problem is the simple the fact of narrative path the movie follows. What do I mean? Well, its formulaic path shows the rise and fall of the band in a somewhat VH1’s Behind the Music that highlights the major plot points of the band’s journey through the 1970s and 80s. What also doesn’t help is the fact the first act of Bohemian Rhapsody feels incredibly rushed, skipping out on a lot of character build moments that could’ve helped strengthen the feature in entirety. Again, the movie hits the right moments to present (i.e. Freddie’s humble beginnings, him join the band, Queen slowly becoming famous), but it makes for some pieces of the film’s puzzle that are missing (i.e. story chunks missing) as if Singer nor Fletcher weren’t interested in Queen’s early days on the music scene. That being said, the film’s second and third act flow much better, so it does make up for that in the end. Another issue that didn’t bother me as much (but it might bother some out there) is that Bohemian Rhapsody is rated PG-13 and not so R-rated. Why is that important? Well, since the movie does focus a lot of its time Freddie Mercury, the film showcases his homosexuality and how it plays a part in his life, especially in his relationship with Mary Austin and how he became more eccentric and embraced his more flamboyant side. To me, it didn’t bother me as the movie represented Freddie’s sexual appetite and queerness effectively, but (again) an R-rating could’ve helped capture the more “wild” side of Freddie’s private life instead of some more “tamed” moments that film features. It’s clear that Singer / Fletcher want to tell this part of Freddie’s personal life, but might’ve been restricted to keep those particular events on a PG-13 level. The cast in Bohemian Rhapsody has plenty of recognizable names and faces that play these characters (of which are based on real-life individuals), bringing them to life on the silver screen of a feature film. While some characters get more screen-time than others (you’ll see what I mean), the actors / actresses that play them help elevate their respective characters that they portray. Leading the charge (and definitely shines the brightest in the movie) is actor Rami Malek as Farrokh Bulsara (aka Freddie Mercury). Malek, known for his roles in Mr. Robot, The Pacific, and Night at the Museum, truly does a fantastic job in the role. The way how he throws himself into the role (fake teeth and flashy outfits) truly does make us (the viewers) believe that he is Freddie, especially how he mimics all the body mannerisms and back-arching movements that the real-life Freddie Mercury was known for in his concert performances. With the film focusing a lot of time of the character, Malek also embraces all the eccentricity and queerness that Freddie was known for, which translates beautifully on-screen. To be honest, I really wasn’t expecting such a great performance from Malek (I thought it would be good, but not as great as he did in the film), so I was quite blown away by his acting talents in the feature. In the end, Malek’s portrayal of Freddie Mercury in Bohemian Rhapsody is incredibly great and provides probably the best role for the actor in his entire career (so far). The movie also showcases the love (and interests) that Freddie Mercury courts, examining the lives of both Mary Austin (Freddie’s girlfriend / lifelong companion) and Paul Prenter (Freddie’s personal manager), who are played by actress Lucy Boynton (Murder on the Orient Express and Sing Street) and actor Allan Leech (Downton Abbey and The Imitation Game). Of the two, Leech’s Paul shines the brighter and does feel like a more developed character than most of the supporting players of the feature, especially considering his closeness to Freddie’s more queer side. Unfortunately, Boynton’s Mary complicated relationship with Freddie is a bit underdeveloped. It starts off strong, but becomes less and less important, failing to leave an emotional impact, despite the movie trying to do so. Nevertheless, both Leech and Boynton do provide great acting talents to the film, but one is more prominent than the other in the movie. The other Queen band members do get short-end of the stick when it comes to crafting them into well-rounded characters for the feature. Of course, they are in the movie and do play pivotal roles throughout Queen’s journey in Bohemian Rhapsody, but they do lack their “own” personal stories in the movie. However, the actors behind them, including actor Gwilym Lee (Midsomer Murders and Animal Ark) as Queen’s lead guitarist Brian Taylor, actor Ben Hardy (X-Men: Apocalypse and Only the Brave) as Queen’s drummer Roger Taylor, and actor Joseph Mazzello (Jurassic Park and The Pacific) do actually help bring these characters to life, despite the film not focusing on them enough to make wholesome in the feature. Still, it wouldn’t be a movie about the band Queen without them being a part of it. Rounding out the cast for Bohemian Rhapsody (in more supporting roles) are actor Aidan Gillen (Game of Thrones and Maze Runner: The Death Cure) as Queen’s manager John Reid, actor Mike Meyers (Austin Powers and Wayne’s World) as EMI Executive Ray Foster, actor Tom Hollander (Pride and Prejudice and Pirates of the Caribbean: Dead Men’s Chest) as Queen’s lawyer turned manager Jim Beach, actor Aaron McCusker (Shameless and Dexter) as Freddie’s second love interest Jim Hutton, actress Priya Blackburn (Pulling) as Freddie’s sister Kashmira Bulsara, and actor Ace Bhatti (Bend it Like Beckham and EastEnders) and actress Meneka Das (Little Box of Sweets and Another Year) as Freddie’s parents Bomi and Jer Bulsara. The only thing more extraordinary than their music is his (Freddie Mercury) story in the movie Bohemian Rhapsody. Director Bryan Singer (along with Dexter Fletcher) latest biopic drama tells the “behind the scenes” tale of Queen’s rise and fall and everything in-between, especially on the peculiar life of lead vocalist Freddie Mercury. 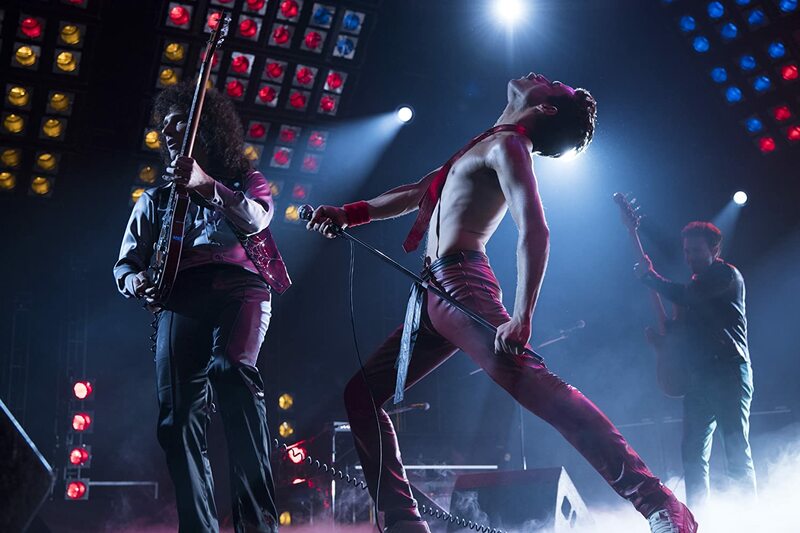 While the movie stumbles in its standard storytelling arc and fails to capture the personal lives of Queen’s other band members, the film succeeds in its engaging story, the various musical sequence numbers, and the acting talents behind each character, especially Rami Malek. Personally, I’m probably going against “the majority” grain of film critics in saying that I liked this movie. While there were a few problems that the film couldn’t escape, the overall presentation of the feature was solid as well as entertaining (both cinematically and musically). Thus, I would say that I would give Bohemian Rhapsody my “recommended” stamp of approval as the movie, despite flaws, is still a solid musical endeavor for such an iconic band. Plus, even if you don’t care for the film itself, the music sequences definitely will. In the end, while the movie might capture the fullness of Freddie Mercury’s life and the legacy of Queen’s other band members, Bohemian Rhapsody is a cinematic reminder of why this legendary and iconic band was so beloved and incredibly fascinating during their heyday zenith…when Queen was king. That was a slightly more comprehensive look at the movie’s production than I’d expected. Didn’t know some of those things. Haha…why thank you. Always good to enlighten my readers about the movie. Queen was the foundation of my High School Years, so I’ve been putting off seeing this movie, for fear of what it might do to my memories of listening to Radio Ga Ga, Hammer to Fall etc. But you’ve made me pick up the phone and ask a good friend if she wants to go see it with me. We’re both of an era when we used to record Queen songs from the radio onto cassettes to listen to. Thanks for your in-depth and thorough review. Thank you, my friend. I hope that you and your friend liked the movie. Personally, I loved it. Oh you will not believe it, just as we had finally organised a date around kids and partners the cinema took it off!!!! Argh!!! I am eagerly waiting to see this one. As a preteen of the 70’s and a teen of the 80’s I grew up listening to Queen. The memories of putting on a record (yep, the LP) and standing on barstools as we jammed on our guitars (tennis rackets) are some of the best of my life. Thanks for the review, and I’m definitely encouraged to get to see it. Nice. I’ll have to check it out!